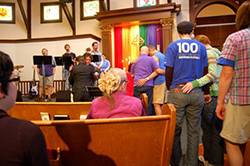 In worship at MCC Portland, we include all the usual elements of worship – in our own extraordinary way. We pray, we sing, we remember the stories of our faith, and share the stories of our own lives. We seek to be inclusive in our worship; that is, we try to affirm all genders, races, orientations, and abilities in our experience of worship. Because members and friends of MCC Portland come from a wide range of Christian and non-Christian traditions and because we can find value in the gifts of many faiths, we create a blended worship experience that honors a variety of forms of worship. One thing about worship at MCC Portland: it will be unlike anything you have experienced before.